I've been invited to participate in this year's CTM Festival Music Maker's Hacklab in Berlin this January/February. More info at this link The lineup is fantastic. New people, new sounds, new possibilites! I've been appointed Clinical Professor of Physical Computing at the Department of Media Study, the University of Buffalo. I am completing my Summer appointment at the University of Washington in the Department of Human Centered Design and Engineering. I am piloting their new IoT (Internet of Things) course. It has been a hoot and the participants are engaged and challenging me. It's a good gig. 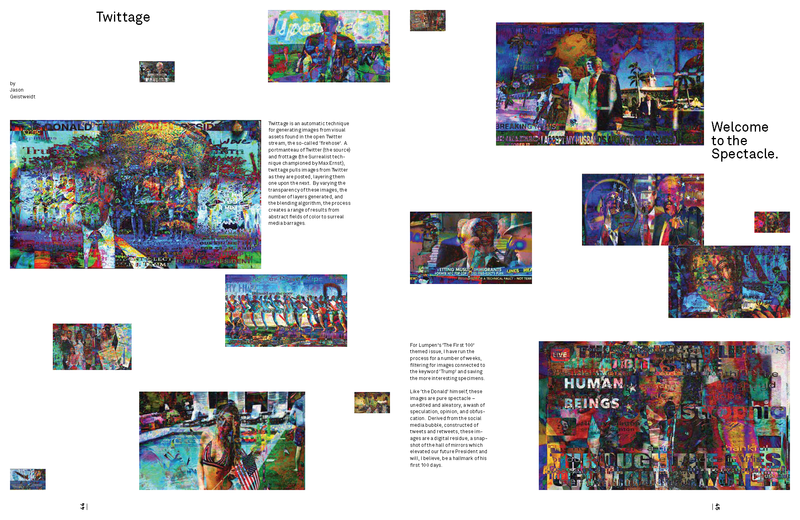 Examples of my twittage (Twitter + frottage) techique for rendering collages from the visual assets of the Twitter open stream are featured in Lumpen's First 100 Days edition, focusing upon the inaguration of Donald Trump as the United State's 45th president. The 2-page spread is below, though I feel the design choice to render the images at such a small scale reduces the readability of the images, so I have included a few of the images at a larger scale.